I think it has something to do with a TV show, The River, that I'll never watch. Hopefully I never come across anything like this while hiking or being in the wilderness! It would be much worse than almost stepping on a rattlesnake. 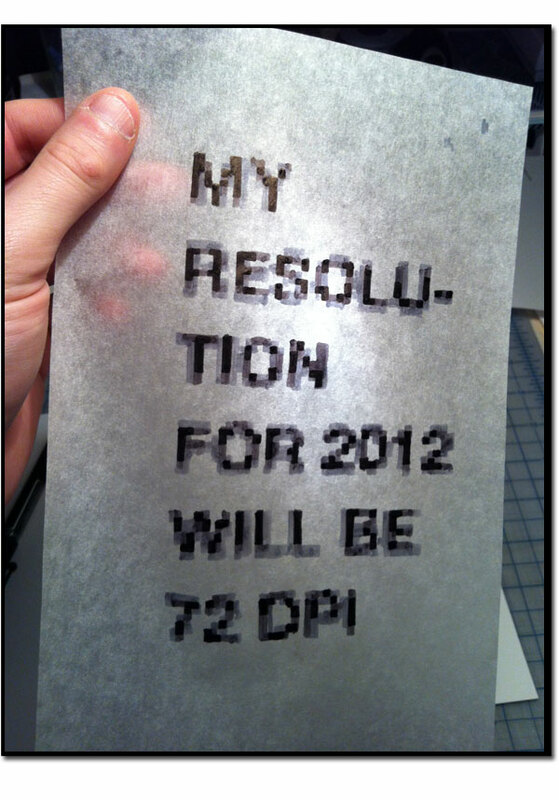 This is a funny bit of graphic design humor I saw on Ffffound! Personally, though... 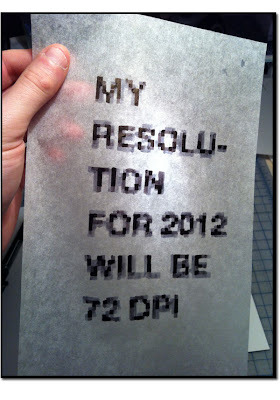 I'd much rather experience the year in high definition. In my career as a commercial designer, most of my creative work is meant for mass market consumption. To be an effective artist, though, it's good to be familiar with a wide range of topics & material. Ancient history & lost knowledge from past civilizations are some of my favorite subjects. Since I work on alot of packaging & product design for games, I like to learn about the history of gaming. My interest in ancient cultures was one of the reasons I created the game Da Vinci's Challenge™ to resemble an artifact from classical times. Games have been around as long as human society. The act of playing games of skill or chance is an extension of the basic pattern-forming capacity of our brain. Games are a way to explore possibilities and a fun way to stimulate the mind. Historically, people with the most leisure time had the most opportunities to play games. The wealthy could indulge in enjoyable pastimes more than a toiling peasant. Also, priests in cultures that followed the movement of the stars spent long nights observing the skies. I can imagine it was common for those at a temple or a royal court to pass the time with games of varying complexity. Common people can make dice out of bones or simple carved objects. 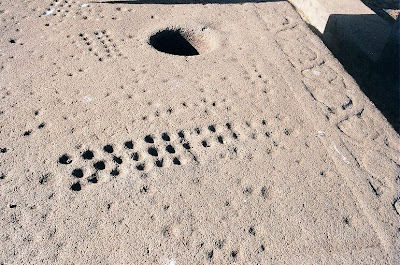 The elite had more intricate creations- like the Royal Game of Ur, a board game found in royal tombs in what is now Iraq. However, there were also games like the Egyptian board game Senet that were enjoyed by the royalty and regular people alike. • The first mass-produced board games in the U.S. were Travelers' Tour Through the United States and Travelers' Tour Through Europe, both published by New York booksellers F. & R. Lockwood in 1822. Here are some other links about Mohenjo-daro, one of the oldest human settlements ever discovered. The archaeological site is littered with game & play-related artifacts. ...and, no - these games were NOT created by ancient aliens. Recently, a strangely-colored critter made the news. 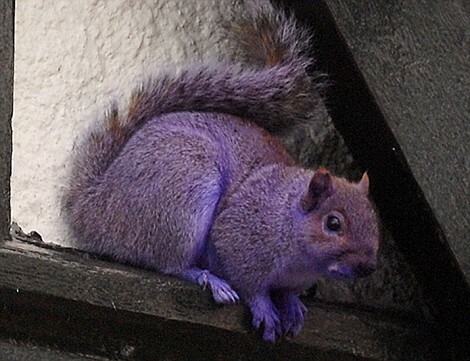 In Pennsylvania, a purple squirrel was found & nobody knows how it got that way. The real answer is that it is a malevolent Trabie has obviously crossed over into our dimension. 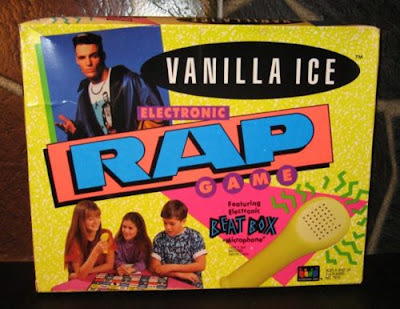 The style of the art on that box is sooo early 1990's. The 90's were basically a hangover from the most tasteless decade ever- the 1980's. When Vanilla Ice's album came out, I was in 4th grade. My aunt got me the cassette tape To The Extreme for Christmas one year, since I was too young to know better. Here is my review of his classic movie. It's so bad that it's awesome. I'm continuing my topical leadup to my trip to Toy Fair in NYC. 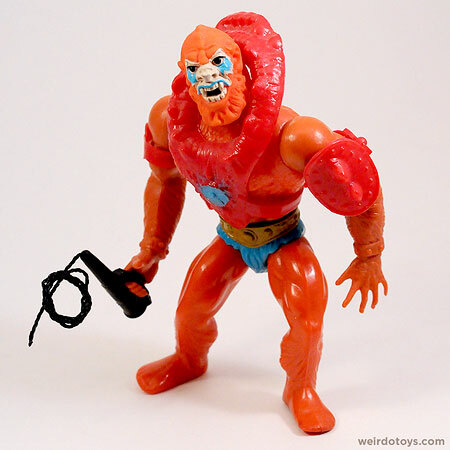 My last post was about bad toys from the past. Now it's time to look at the more promising future of toys & games. 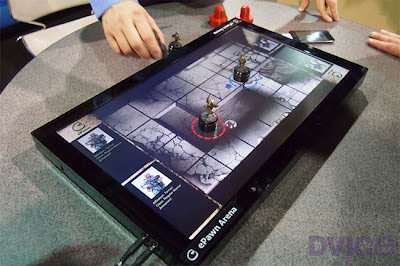 With the prevalence of smart phones & touchscreen computers, digital gaming is an unstoppable force in personal entertainment. I see my little nephews & other toddlers easily navigating iPhone apps, and it seems inevitable that human interfacing with electronics will only increase in the future. However, as long as we inhabit the physical realm, there will always be the need for physical interaction- with humans & objects alike. The appeal of a tangible products or items is not going away anytime soon. That's why I think there's alot of potential for games or other applications that are a hybrid of physical and digital attributes. As we become more enmeshed with electronic devices, it will become more "natural" to interact with virtual interfaces that augment our physical senses, intelligence, & consciousness. At some point, if people engineer a truly symbiotic connection with future digital devices, like an 'Apple iThink', it will be interesting to see how perceptions of the virtual and physical worlds are combined in the mind of the person. 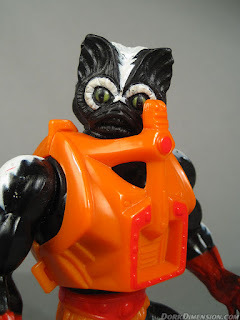 & Stinkor... yes, an action figure that looked & smelled like a skunk (which was just a Mer-man figure painted black & white). They are just awesomely bad toys. "Why won't anyone play with me?!?!?!" As kids, my 2 brothers & I amassed an extensive collection of toys & actions figures over the years. With such a vast collection, we inevitably had most of the crappy toys on that list. Batman's "Bob" & The G.I. Joe character "Chuckles" were off-the-charts lame. I guess when you're trying to create so many characters for a toy line, a few duds are bound to slip in the mix. 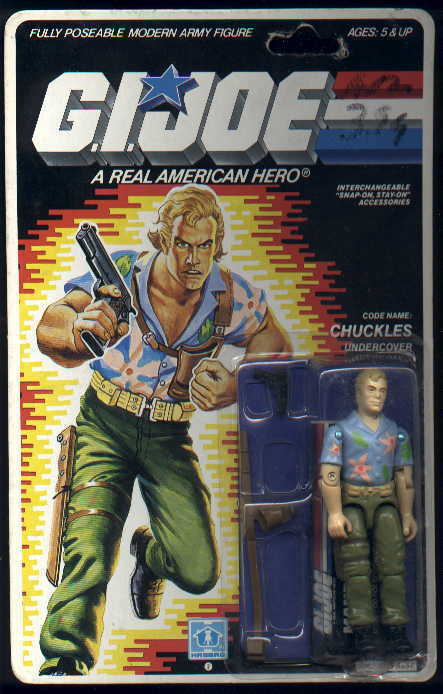 There are plenty of other examples of action figure failures. One day I'll have to gather up some of the worst ones I can find & make my own list. 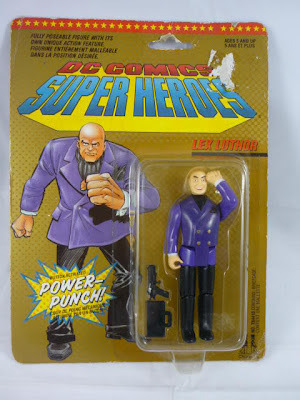 Even the packaging sucked for that that 1990's line of DC superheroes by Toy Biz. This weekend, I'm going to Toy Fair in NYC for a couple days. One reason is to try to find a new publisher for the award-winning strategy game I created & developed, Da Vinci's Challenge™ based on the ancient Flower of Life pattern. We have also developed some other new games, toys, & activities that we hope will create some interest. Toy Fair is an interesting show to attend & I usually feel some visual overload from trying to take everything in. Besides spending the last few weeks trying to prepare for the show, I was in a minor car accident in the middle of January & have been dealing with that situation. Then, I was in work last Wed. & my head started burning up w/ a fever. My fingers felt numb & my body had the chills, despite my head being on fire. The next day the fever went away, but then I had a painful throat infection that lasted several days. It was really bad during the week, but I still went in to work to make sure I got all the stuff done for Toy Fair. I ate nothing but soup for 4 days. To ease the swelling I tried gargling water + everything: salt, honey, hydrogen peroxide, & even cayenne red pepper after seeing it recommended online. Saturday morning I felt relatively better, & ate some cherry water ice that was like a frozen miracle. Last nite I went out to eat with my parents & was so damn hungry that I tried to tackle a burger, my first solid food in days. Even though I had an ravenous appetite, my throat was so raw that each swallow felt like I was swallowing tiny shards of glass. My Dad was laughing at me, saying I looked like an alligator the way I was grimacing & struggling to put down each gulp. FINALLY, I woke up this morning & could swallow with no discomfort at all! Hallelujah!!! Most of the day, I was still reflexively wincing each time I swallowed, even though it didn't hurt anymore. No matter how much awareness we place on our well-being, we easily take for granted what a blessing it is to experience life free of debilitating pain. Anyway, the physical discomfort was enough to frazzle my mind as I've been trying to focus on dealing with the rest of life's steady march of craziness. I saw the optical animated GIF below & thought it was a good representation of my general state of mind during the last week. IT WILL SCRAMBLE YOUR BRAIN!!!! This is a cool video I saw on BoingBoing that shows the endless creative power that people are developing with the aid of computers. Ever-improving digital tools are crucial in generating visuals that we mere humans could never create with physical means. Most of my art is done with computers- so it's the brush, paint, & canvas of my artistic life. Usually, I can directly translate imagery in my mind's eye onto the screen, using Adobe software or other image-generating programs. The magical process of interfacing with machines is so ubiquitous now, it's often taken for granted. On the other hand, I personally often think how amazing it is that we can manipulate these pixels of light around a translucent surface to externalize our thoughts. Technology is like an alchemical process of forming new things from existing elements. As long as communication and innovation are continually encouraged, there's no telling what astonishing feats man will one day see as commonplace. 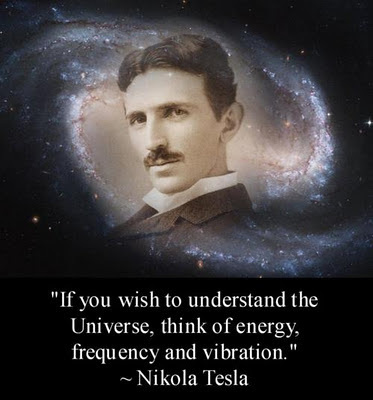 think of energy, frequency, and vibration."